The kid who blows up at you when you tell him to stop talking, the girl who is bawling because she failed the test, the boy who forgot his homework for the 3rd time this week – there are so many issues that interrupt our day and what we’re trying to accomplish. But I’m challenging myself to stop thinking of them as interruptions – and I think you might want to, too. Right now I’m staying home with 2-year-old son Clayton and 2-month-old daughter Calaiya. And it’s just amazing how many interruptions there are when I’m trying to get something done. A request for a snack, a new mess to clean up, and – most frustrating – some type of misbehavior to deal with. Be it whining, screaming, disobeying, throwing toys, hitting the baby sister, not sharing, or a myriad of other deviant behaviors, one thing’s for sure. There’s no shortage of teachable moments. Wait a minute. Did I just say teachable moments? What if I started viewing these interruptions as what they are – teachable moments? What if I started embracing them as opportunities to train my son and to speak truth into his life? What if I stopped dreading them and started looking forward to them? What if I stopped being so concerned about my to-do list and started focusing on the real reason why I’m at home in the first place? You see, if you were to ask me why I’m staying home instead of teaching, I would say that I want to be the one to teach and train my children – not a family member, babysitter, or daycare. So if my ultimate goal for this season of life is to train my children, then I should be embracing these opportunities instead of letting them frustrate me. My blog post can wait. Dinner can be five minutes late. And there’s no hard and fast rule that my 25-minute exercise program has to be 25 consecutive minutes. A case in point – just the other day while I was exercising little Calaiya started to cry. So I grabbed a few toys to set in front of her so that she could look at them. Of course, Clayton now became very interested in those toys that he previously was ignoring and decided that he wanted to play with them – all three of them. Right now. Too many times I just ignore this and keep exercising, but this time I realized I needed to stop and do something. When he wouldn’t share, I took the toys and put them up on a shelf where he couldn’t get to them. Then we tried again with some new toys. Back to exercising until 3 minutes later when Clayton grabbed those toys and we repeated the process. Thankfully the third time was the charm, and Clayton finally allowed his little sister to have a turn with his precious toys. I could’ve kept working out, but I’m really glad I took a couple minutes to take advantage of that teachable moment. Yes, it was an interruption. Yes, I would’ve rather kept my heart rate up. But it was well worth it to help Clayton learn to share with his sister. The “interruption” was way more important than the workout. Why Are You a Teacher? So back to teaching. In the classroom there is so much to do – lessons to teach, plans to prepare, tests to grade. The list is just endless. And too often our never-ending to-do list causes us to get frustrated by the interruptions. And too often we just end up quickly slapping a proverbial Band-Aid on the situation so that we can get back to our work as soon as possible. But wait a minute. What is the real reason that you’re a teacher in the first place? Most likely it’s not so that you can grade a bunch of papers. It’s not so that you can write stellar lesson plans. And it’s probably not even so that you can make your students science whizzes. Isn’t the reason that you’re a teacher so that you can make a lasting impact in your students’ lives? If it is, then these “interruptions” are actually the most important part of your day. They’re the chance for you to make a real difference. The opportunity to embrace the teachable moment for what it is. The privilege to counsel a student and help them mature just a little bit. So the next time Eddie acts up or Valerie forgets her homework, don’t let it frustrate you. Instead, plan your response and take advantage of that teachable moment. That may be easier said than done, but I’m up for giving it my best shot. Are you? 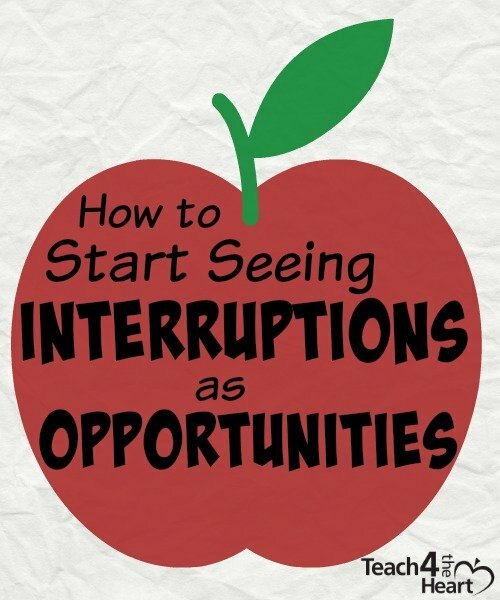 Do you tend to view interruptions as an annoyance or an opportunity? What do you want to change about how you view discipline problems opportunities? What a positive way to view “interruptions.” Another reminder that it’s often not the situation that’s the problem, it is one’s attitude towards it. Thanks for the post!